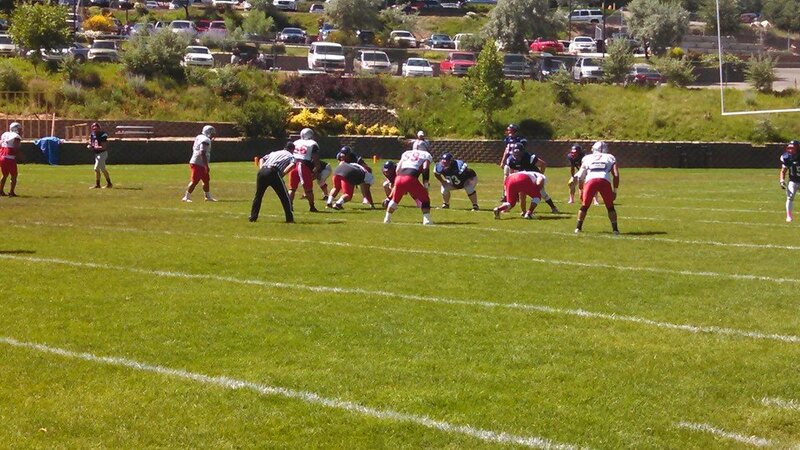 LAYTON – With a myriad of jet fighters soaring overhead for the annual Hill Air Force Base Air Show, the Dixie Rebels took to the air, but, were ultimately shot down in their bid for the 2014 RMFL championship, 26-21, by the Wasatch Revolution Saturday at Layton Christian High School. Dixie came up just short despite being forced away from its traditional running attack and surrendering six turnovers in the championship bout. Though Misi Tupe and company experienced some success in the air, too many mistakes came in the form of interceptions. Five picks for the Rebels proved to be insurmountable. 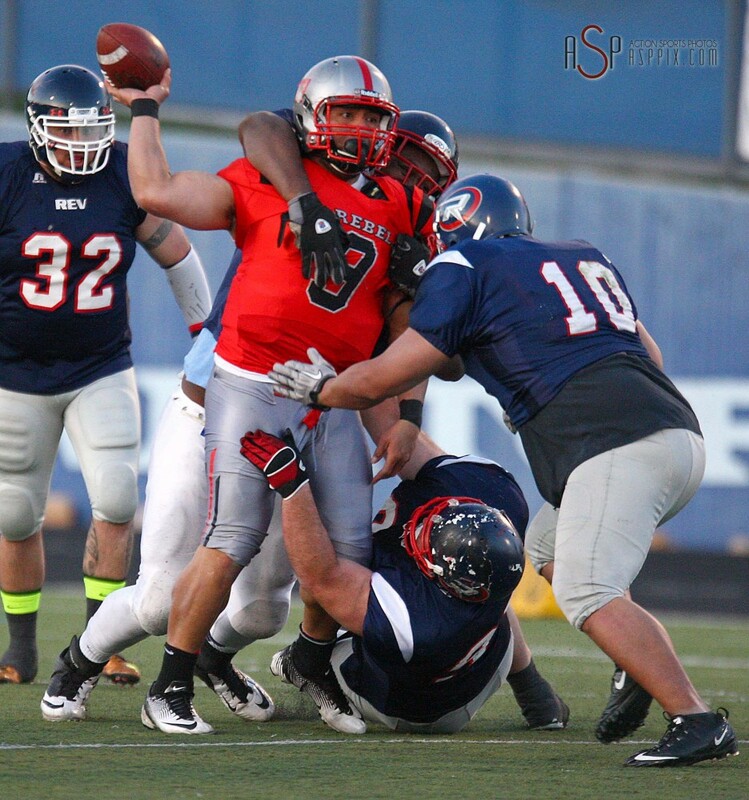 Wasatch, which often stacked eight or nine defenders in the box, prevented the Rebels from rushing and allowed the league leading rushing attack duo of Tupe, Rimo Mapu and Sione Tapuosi only 95 total rushing yards. Castillo’s most important interception of the afternoon came as a game-sealing grab at the end of regulation. Tupe, who had one play to produce a go-ahead touchdown from his own 35 yard-line threw a deep-ball up for grabs. Castillo won the jump ball and ducked out of bounds. The celebration then began for the Revolution. The Rebels led for the first three and half quarters. Early on, Dixie found success passing and jumped out to a quick 14-3 lead when Tupe found Viliami Hafoka, and James Thompson from 18-yards and 88 yards out. The Revolution rode the passing success of field-general Charlie Petersen in order to close the gap and eventually take the lead. Petersen, who passed for 212 yards and two touchdowns, helped Wasatch take its first lead, 19-14, with 9:47 remaining in the fourth quarter. Petersen was knocked out of the game with an elbow injury to his throwing arm on the ensuing drive, but the Revolution adopted a Wildcat style offense to put the game on ice. Wide-out Eteuti found the end-zone for a second time with 3:51 remaining, this time as a rusher out of the Wildcat formation, to put Wasatch up 26-14. The Rebels on the next drive rallied and Mapu got away from defenders for a 22-yard touchdown with 1:53 left to cut the deficit to 26-21. Dixie’s onside attempt was unsuccessful, but the Rebels held the Revolution to three-and-out and got the ball back with 0:50 left in regulation. The Rebels advanced the ball to their own 35, but Castillo would extinguish the comeback attempt with his third pick of the day. The Rebels, who fought through the playoffs on the road as a five-seed, won on the road at Arco and Brigham City before coming up short in the RFML Championship. Dixie finishes its 2014 campaign 9-2 and second place in the RFML AAA league. The Revolution finished 10-1 and were given the RFML Championship trophy after Saturday’s win. Castillo noted the growing rivalry against Dixie, who they split with in the regular season. The Revolution, who’s only loss of the season, came to Dixie in the 2014 opener ended up on top of the RFML world.